Proper nutrition is more important than ever when you're expecting. It's difficult to get all the vitamins and nutrients you need in your diet, especially if you're having trouble keeping certain foods down. Your baby needs adequate levels of nutrients every day to grow properly, so it's crucial to eat a balanced diet and take your prenatal vitamins. If you find the vitamins make you feel nauseous, try taking them with a meal or right before you go to bed. Folic acid, or vitamin B-9, is one of the most important nutrients to help ensure the health of your baby. Neural tube defects, such as spina bifida and anencephaly, occur early in the first trimester, and taking the proper amount of folic acid can reduce the risk of these conditions by 50 to 70 percent, according to the Centers for Disease Control and Prevention. 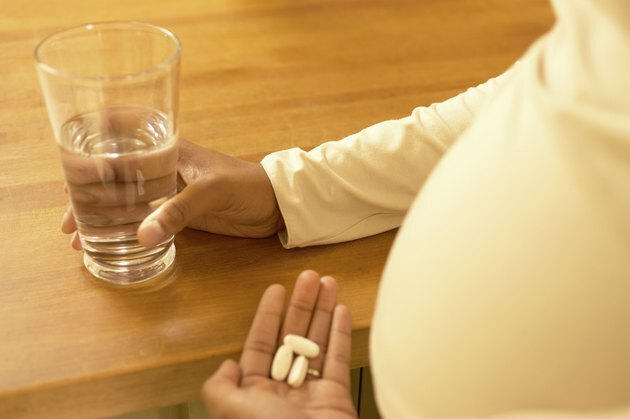 It's best to start taking a prenatal vitamin or multivitamin with at least 400 micrograms of folic acid for at least a month before you conceive, but at the very least start taking it as soon as you find out you're pregnant. When you're not pregnant you only need about 18 milligrams of iron per day, but you need 27 milligrams daily when you're expecting. Your baby and placenta need the extra iron, particularly in the second and third trimesters, and many women don't have enough iron stored in their bodies when they become pregnant. If you don't get enough iron your baby has a higher risk of being born early or at a low birth weight. Taking a daily prenatal vitamin helps ensure you're getting the iron you need. Your baby needs calcium to grow and develop properly. If you're not getting enough in your diet your body will leech the calcium it needs from your bones, putting you at greater risk for osteoporosis, explains the Cleveland Clinic. You need at least 1,200 milligrams of calcium per day, and most prenatal vitamins contain at least some calcium to help you get enough in combination with calcium-rich foods in your diet, such as low-fat dairy products, dark leafy greens, broccoli and spinach. DHA, an omega-3 fatty acid, is important to ensure proper brain and eye development. Many fish contain DHA, but it's hard to get enough in your diet since you're limited in what kind and how much fish you can eat when you're pregnant due to mercury concerns. A prenatal vitamin that contains DHA can help, and you can also find eggs enriched with DHA. A study published in "The American Journal of Clinical Nutrition" in 2013 found babies of women who took 600 milligrams of DHA during the last half of pregnancy had less risk of preterm birth and were a higher weight at birth than babies born to women who took a placebo.